New Thomas Gunn Soldiers on Parade! Including at least one very famous face! 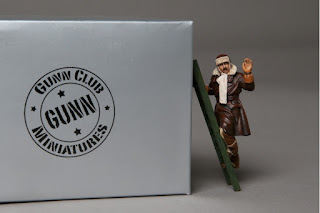 It's been awhile since we reviewed some of Thomas Gunns finest, the reason being that they've been doing so well and have been so busy that they just haven't had time to send me anything to review, until now. If you check their website this can hardly seem like a surprise. All the soldiers they release are excellent but over the last few months they have been excelling themselves! The recent WWI pilots are absolutely amazing, you must go check them out and grab yourself one or two...oh what the heck buy them all!! First in line is GB002 Scots Guard Marching. 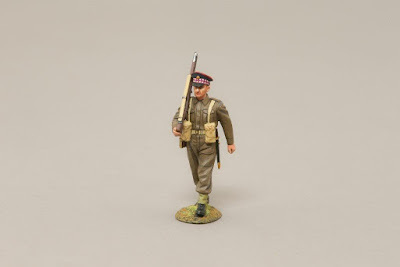 This is the second WWII Scots Guard on parade release, the previous miniature GB001 was a Scots Guard standing sentry. Both miniatures are in battle dress wearing No1 dress peaked cap. The Scots Guards is one of Great Britain's famous historical regiments dating back to 1642 formed under the reign of Charles 1st to serve in Ireland and were originally known as Marquis of Argyll's Loyal Regiment. They served with honours in the Great War and during WWII were based in North Africa, Italy and France. This soldier is marching on parade and as usual for Thomas Gunn is limited to 100, though if demand is there they will produce more:). The sculpt is faultless and the paint work absolutely perfect. Take a close look at the base. You can even see tufts of grass poking up:) The sort of detail I've come to expect from Thomas Gunn. I've yet to see a miniature that doesn't ooze quality. 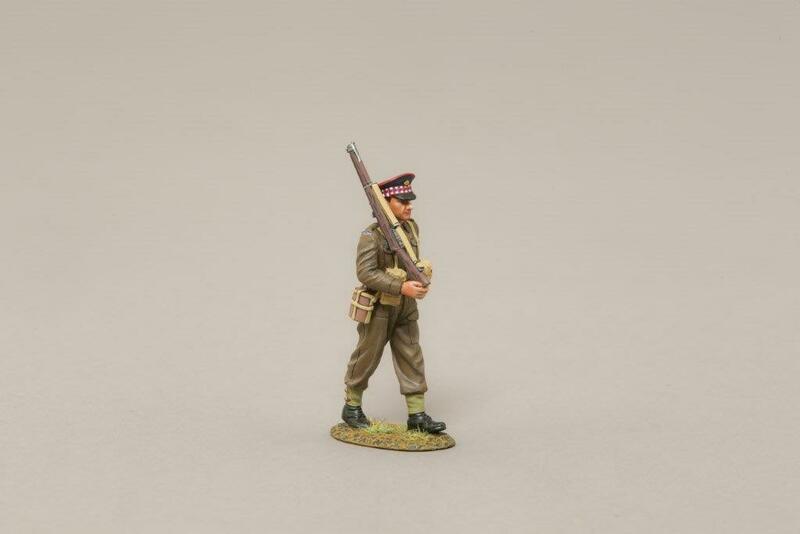 I'm so happy they have been so busy as they deserve it when time and time again they release such fantastic soldiers as this Scots Guard who is marching in front of me. As you can see in the picture above it looks amazing when you have a few of them all marching in line. 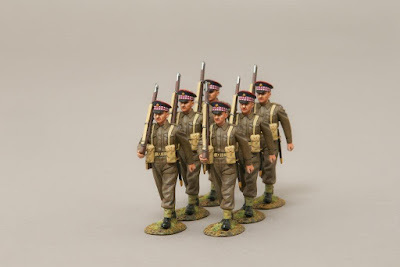 Thomas Gunn have stated more Scots Guards on parade will be released during 2017 and I for one can't wait. Limited to 100 he retails at £32. Another Thomas Gunn bargain. Next we go back in time to our WWI release that's up for review. Last review we met some historical figures from WWI. We met Ben Butler, a footballer who served and died in the War, plus a famous war artist Muirhead Bone. This time we meet someone whose name I'm sure is known by all our readers. Probably (along side Wilfred Owen) the most famous Poet to come out of WWI, Siegfried Sassoon. What can I say about Sassoon that you don't already know? In the UK anyway there probably isn't a single person leaving school who hasn't studied Sassoon, not in History lessons but in English Literature were his war poems are, and most likely always will be, part of the curriculum. Sassoon and Wilfred Owen I'd say are the most well known poets here in Blighty. Sassoon at first actually enjoyed the War and was a first rate Officer, loved by his men. He won the Military Cross and was also recommended for the Victoria Cross. However the futility of it all and the horror of the trenches became apparent and he threw his Military Cross into the sea. He went on to write "A Soldiers Declaration" which was read out in parliament. This anti war rhetoric didn't go down well with the powers that be and he refused to go back to the trenches, so he was sent to a psychiatric hospital in Scotland, the Craiglockhart War Hospital run by Dr Rivers, as a shell shock case, this they said was the reason for his behaviour. Whist there he met Wilfred Owen. Another close friend of his was the author of the WWI memoir 'Goodbye to all That' Robert Graves. It was Graves who managed to stop Sassoon going to military prison and instead being sent to the hospital. It was also Graves, along with his own conscious regarding leaving his men out in France, which made him stand down and go back to France. Not long after he returned he was shot in the head by accident by a British soldier and sent home again. After the war he wrote the excellent 'Memoirs of an Infantry Officer', a fictional account of his War experience. He served with Robert Graves in the Royal Welch Fusiliers. He is not only mentioned in Robert Graves book but also in the superb, must read, 'The War the Infantry Knew' by J Dunn, Capt Dunn was the medical officer for the 2nd Royal Welch Fusilier Battalion. Two other books written by serving soldiers in the Royal Welch are the superb 'Old Soldiers Never Die' by F Richardson (unusually for a Great War memoir Frank was a private) and 'Nothing of Importance' by B Adams. In recent years Pat Barker wrote the excellent Regeneration trilogy which focused on Dr Rivers and Sassoon and Owen are in the book as is their meeting in hospital, though obviously this is a fictional account. A film Regeneration was also made which I recommend. GW072A The Poet. 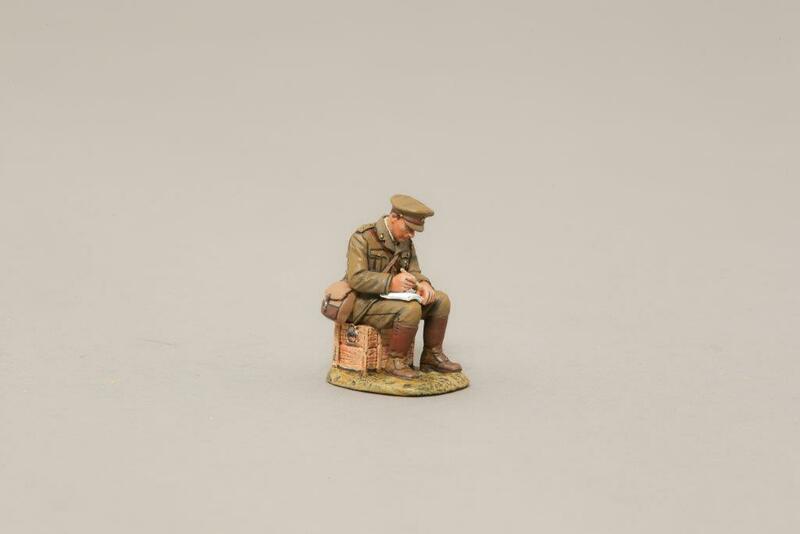 The sculpt of Sassoon has him sitting on a wooden crate with pen and notepad in hand. 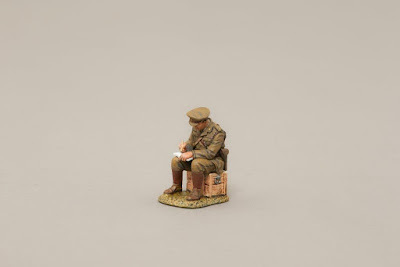 I'll leave it up to you to decide on what he is writing, could it be the "A Soldiers Declaration" or is he penning another of his timeless classic poems, or maybe something more war like, like a trench raid plan (as he enjoyed those). The sculpt is first class. His posture is natural and easy on the eye. As standard for Thomas Gunn I can't fault the paintwork. He is limited to 100 and retails at £32. 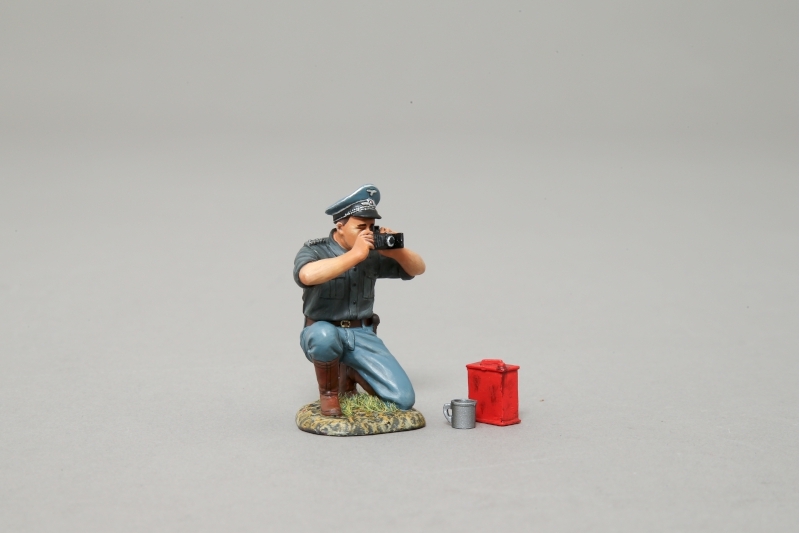 Now who wouldn't want a Sassoon miniature? I'm pretty certain these will sell fast! Now we jump forward again to WWII. However we are sticking with an historical figure. This time we have a famous German Ace Major Bruno Meyer. Bruno Meyer was one of WWII top rated pilots. With over 500 combat missions and around 50 tanks destroyed you can see why. To fly so many missions as a ground pounder is something to be marvelled at, coupled with is superb kill tally he can stand proud with the likes of Rudel and 'Bubi' Hartmann. Flying both the FW190 and the HS129 he would have been a total menace to any Russian tank commander who was aware he was flying in their vicinity. He was born in Haiti and joined the party in 1933. On 21st August 1942 he was awarded the Knights Cross. His last command was with 1/SG 104 flying both FW190 F & G and JU 87 D & G.
Here he is kneeling down taking a photograph, possibly of his plane or maybe his squadron members. His posture is very well sculptured and looks natural. The paintwork is faultless. Again note the blades of grass poking up around his boots! He also has a cup or most likely ersatz coffee as well as a jerry can (no doubt has a similar taste to his coffee!). I love this miniature. The idea of him taking a photograph was pure genius, as it works perfectly. 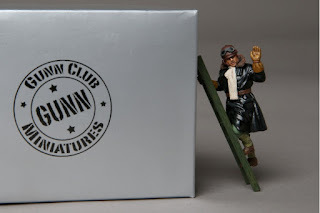 Thomas Gunn have announced they will be releasing two planes that would go with Bruno, a 75mm long cannon HS129 and the shorter 37mm cannon version. He is limited to 100 and retails at £32. Like Sassoon I'd grab him whilst he is still around. 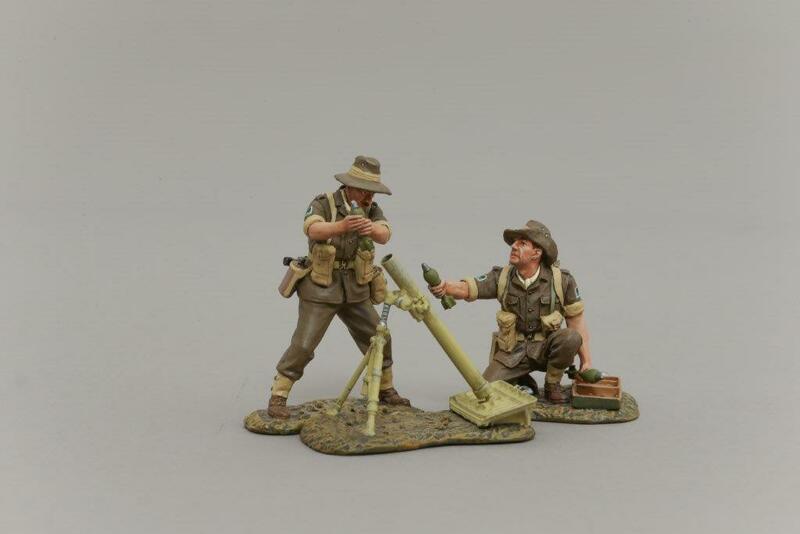 RS042B 8cm Mortar with Crew (Early War). The last miniature for review this time is a two figure set, and one you may well recognise. Click here and then scroll down and you'll come across this same sculpt. However that time they were wearing Australian Jungle fatigues, as they were fighting the Japanese, in the jungles of the Pacific. This time however, they are still Australian soldiers, but are fighting in the deserts of Africa, against Rommel's infamous Afrika Korps! As you can see they create an excellent little diorama all on their own. Their postures are dynamic and really capture the intensity of the moment. Just like the jungle set the paintwork is absolutely perfect. Typical Thomas Gunn quality. Again limited to just 100 this two figure set retails at £75. A bargain. Now I leave you with a couple of pics of Thomas Gunns recent WW1 pilots. WOW! they look fantastic. Until the next time...when I'll showcase some more of Thomas Gunns jaw dropping miniatures...bye!